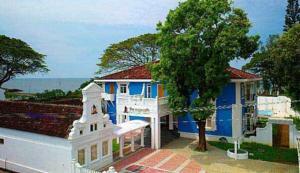 Housed in a renovated Dutch colonial building, Poovath is located on the white sands of Fort Kochi Beach. Overlooking the Arabian Sea, it features an outdoor pool and a restaurant. The Poovath Heritage Hotel is a 5-minute walk from Jewish Street and Synagogue. Just a 10-minute walk from Saint Francis Church, it is 40 km from Cochin International Airport. Fitted with wooden flooring, air-conditioned rooms at the hotel feature large windows with sea or garden views. Private bathrooms come with a bathtub and a hairdryer. A flat-screen TV with cable channels and a minibar are included. Poovath Heritage’s restaurant serves a variety of dishes, including Indian, Thai, Chinese or European dishes, accompanied with sea views. In-room dining is possible. Travel arrangements can be made at the tour desk. Guests can have a quiet read in the library or use the free Wi-Fi provided in the hotel’s public areas. Free! One child under 2 years stays free of charge when using existing beds. One older child or adult is charged INR 1200 per night and person in an extra bed. Maximum capacity of extra beds in a room is 1. There is no capacity for cots in the room. Any type of extra bed or child's cot/crib is upon request and needs to be confirmed by the hotel. Supplements will not be calculated automatically in the total costs and have to be paid separately in the hotel. American Express, Visa, Euro/Mastercard, Diners Club, Maestro, Carte Blanche The hotel reserves the right to pre-authorise credit cards prior to arrival.